The Sacramental Process is a Parish community, home based Process. In other words the Sacraments are prepared and celebrated in the Parish hall and Church. The Parent/s or guardian are welcomed and informed about a certain Sacrament. Then they take the information, books and their own experience and inform their children, the ways of the Catholic faith. At St. John the Evangelist Parish, we follow the Sacramental Process, which means that we don’t do a “program” our children are informed about our Catholic Faith and they in turn grow into their Catholic faith. We have a Sacramental Team, consisting of the Parish Priest, Pastoral Assistant, Sacramental Co-ordinator and lay people to assist the children and parents. We start a group of children in August to receive their first Confession/Reconciliation in November, before Advent starts. From August to November the children and their parents revisit the child’s Baptism and they prepare for the Sacrament of Reconciliation. They learn about their choices in life and what it means to sin. In early February, we come together to prepare for the Sacrament of Confirmation and First Communion. 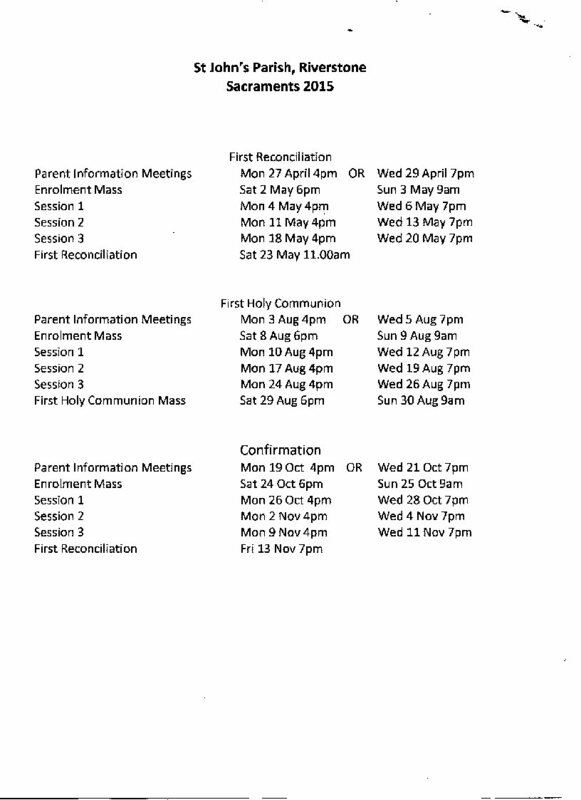 Confirmation is celebrated in the week following Pentecost Sunday, (which is either May or June of that year) usually the Tuesday and Wednesday night at 7.30pm. First Holy Communion is celebrated in the normal Sunday Masses after Pentecost Sunday.